Before modding anything, it is always best to test all your items out first to rule out any possible problems in troubleshooting later. It can save you time and frustration if something unfortunately goes wrong; it is not fun to check and redo all your work over and over if the problem was that something was DOA in the first place before you did anything to it. 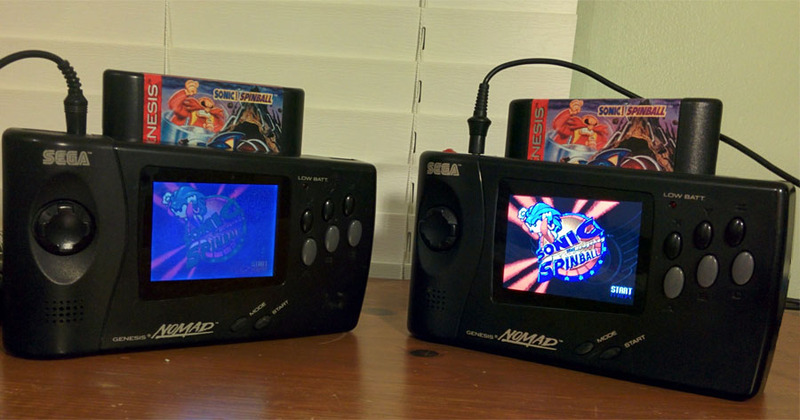 Some screens are better than others as well, so it is best to always test the compatibility of the screen beforehand. With so much turnover on these screens it is impossible to know what the quality of the screen you are getting. Everything looks good here so it’s time to get modding. 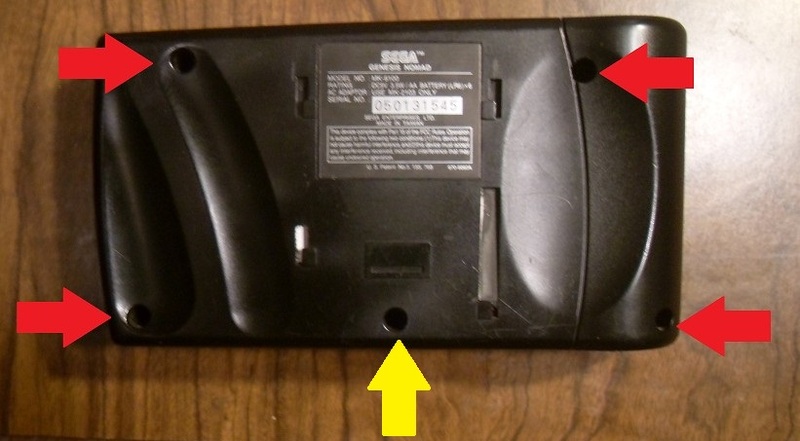 The red arrows point to Phillips screws, and the screw well that is featured by the yellow arrow is a security screw and will need a special Gamebit screwdriver to open, sometimes referred to as a Nintendo Screwdriver. The well is rather deep so it is best to use the actual screwdriver and not one of the nubs that you see for sale, as some of those will not even reach the screws inside. Unfortunately, the Pen Trick from the NES 2 A/V Installation guide will not work as the screw well is too deep and not wide enough. Unscrew the 8 labeled screws to detach the motherboard from the case. The magenta circled screws are for attaching the old screen to the motherboard and will not be reused when the new screen is installed. Unclip the attached wires by the red arrows using some pliers. 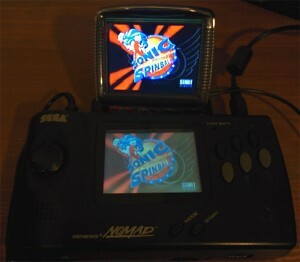 Again, the clip by the magenta arrow in the upper right is for the old screen and will not be reconnected when the mod is complete. With the Nomad open and ready, let’s focus on the screen itself next. For this mod we are using the 3.5″ TFT “Car Backup” screens that are readily available from eBay, Amazon, Dealextreme, etc. Open the screen and take a look at the motherboard for the pinout of the connections. As previously mentioned, there are so many different screens it’s almost impossible to get two boards that look alike, but with only 4 wires it’s fairly easy to figure out their function. Sometimes you get lucky and the wires are color coded, but it’s best to use a multimeter to trace the connections yourself just to make sure. 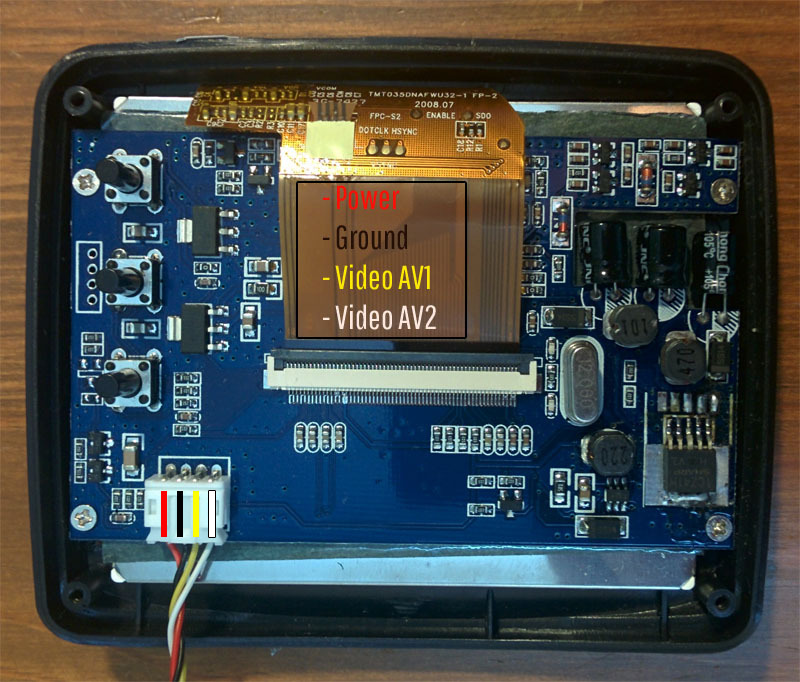 For this screen the pinout is Power, Ground, AV1 and AV2, from left to right, as labeled in the picture. Turn the Nomad and the screen on and glue the screen assembly into the Nomad case. Since the screen cutout on the case is slightly off-center, it’s easiest to do this first before soldering the screen directly to the motherboard so you can use the boarders of the game to center the screen correctly and have more leeway to adjust the screen and better determine a suitable wire length for inside the case. 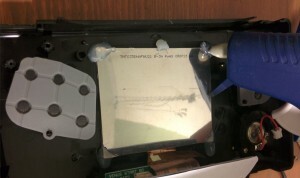 With the screen glued in and properly secured, place a piece of paper on the top of the assembly to keep the Screen’s and Nomad’s motherboards from accidentally coming in contact with each other and possibly causing shorts. 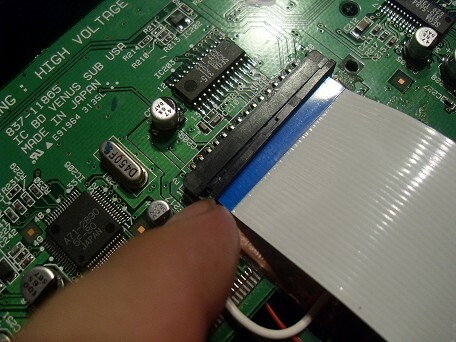 No changes will be made to the back Nomad board for this mod, so you can disconnect the ribbon cable to get it out of the way. Simply pull out the tabs on both sides of the cable to open, and it will fall right out. Make sure to reattach it when testing and when closing the unit up upon completion of the mod. Time to say goodbye to the old screen. Cut off the ribbon cable with some scissors, an exacto knife, or any sort of cutting implements that are in good condition, well oiled, with little to no rust. Saws, and what have you. Peel off the remaining strands from the board to make a nice clean area to discourage shorts. No turning back now! Here is the Nomad motherboard with the areas that we will be working with highlighted. 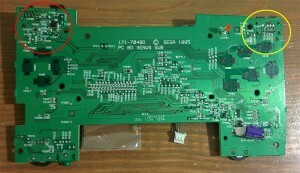 It is best to wire a ground connection on both sides of the board, one by the power connection and one by the video connection. Some screens allow you to get by with just one ground connected, but wire both spots up just in case. Cut down the wires somewhat so they don’t pile up into a rats nest and take up too much room in the case, but don’t cut them down too much where they won’t properly reach when soldered and in place. 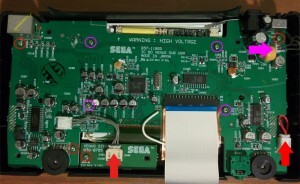 Here’s a close up shot of the power and ground connections, with the wires labeled via their connection from the screen. The screen will now turn on and off directly with the nomad. 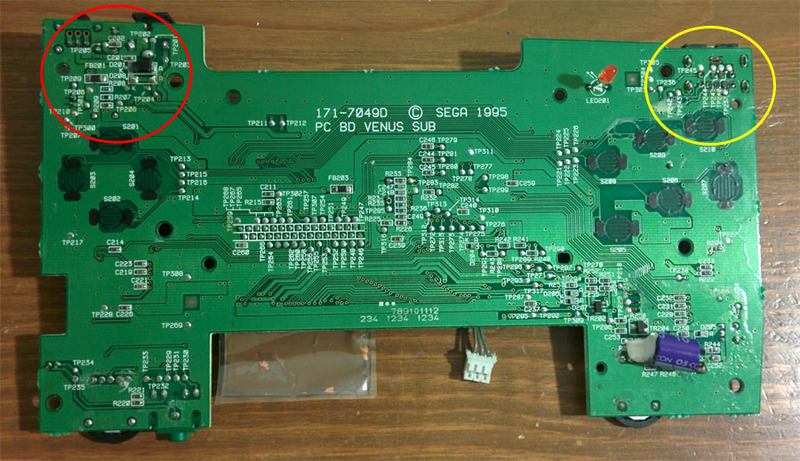 Here’s another close up, this time for the right side of board with the video and ground connections with the wires labeled via their connections to the screen. There are 5 ground pins to choose from on the video side, any of them will work but the one noted in black works out the best for keeping the wire from hitting a screw mount. Make sure none of the contacts are bridged on the video connection. Use some electrical tape to secure the wires in place so they don’t get in the way of any screw holes or posts. Always test your work before completely closing up the console. 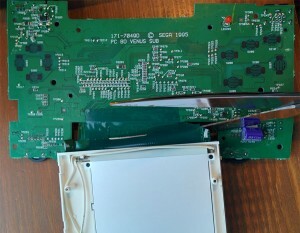 With all the soldering complete, plug the ribbon cable back in, toss in a game and cross your fingers. Troubleshooting tip: Be mindful when inserting the game. 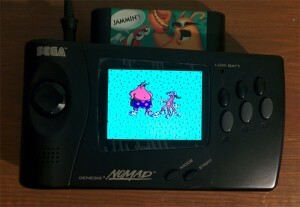 When the Nomad is closed, games can only be inserted one way, but there is a possibility of putting the game in backwards with the case removed. When everything checks out, put in and screw all the boards back into place, reconnect all the cables, and screw the case shut. Jammin! The mod is complete and the playability is tenfold as compared to it’s previous state! Not only are the viewing angles, visibility, and colors better, the new screen is more efficient than the stock one so you will get longer battery life. Not a significant amount, but enough to be noticeable. That said, most Nomad battery packs are well past their lifespan, and you still may eat through enough AA’s to consider a different solution. 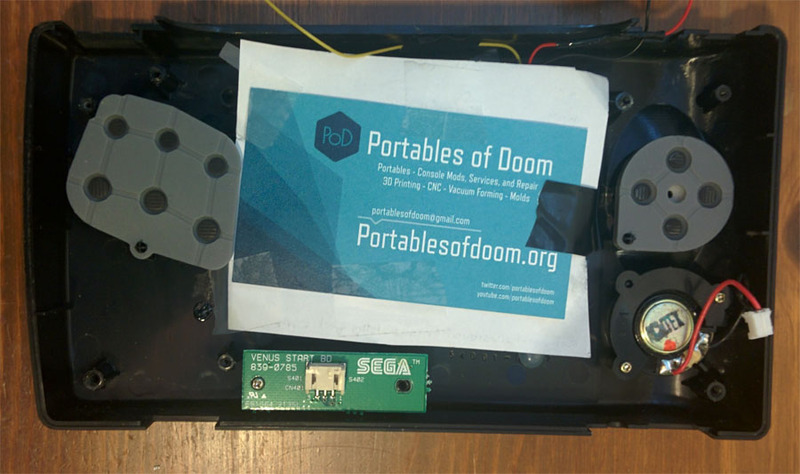 Stay tuned for Part 2, where our next installment of the Sega Nomad Mod Series will be an internal battery! Very cool….. I’m giving this a try and hopefully it will work. As far as AA’s go, my rechargeable ones work just fine so I’m sticking with that until I’m ready to do part 2. 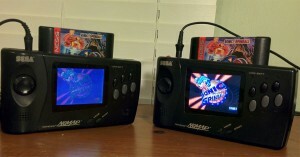 The image difference is immense when comparing the original screen to the LCD replacement, a highly recommended mod for any nomad owner and relatively cheap, I would advise on spending a little more on your LCD to ensure that any sync / blur, frame rate issues are reduced. Great guide guys.